"And over the grass at the roadisde a land turtle crawled, turning aside for nothing, dragging his high-domed shell over the grass. His hard legs and yellow-nailed feet threshed slowly through the grass, not really walking, but boosting and dragging his shell along. The barley beards slid off his shell, and the clover burrs fell on him and rolled to the ground. His horny beak was partly open, and his fierce, humorous eyes, under brows like fingernails, stared straight ahead. He came over the grass leaving a beaten trail behind him, and the hill, which was the highway embankment, reared up ahead of him. For a moment he stopped, his head held high. He blinked and looked up and down. At last he started to climb the embankment. Front clawed feet reached foward but did not touch. The hind feet kicked his shell along, and it scraped on the grass, and on the gravel. As the embankment grew steeper and steeper, the more frantic were the efforts of the land turtle. Pushing hind legs strained and slipped, boosting the shell along, and the horny head protruded as far as the neck could stretch. Little by little the shell slid up the embankment until at last a parapet cut straight across its line of march, the shoulder of the road, a concrete wall four inches high. As though they worked independently the hind legs pushed the shell against the wall. The head upraised and peered over the wall to the broad smooth plain of cement. Now the hands, braced on top of the wall, strained and lifted, and the shell came slowly up and rested its front end on the wall. For a moment the turtle rested. A red ant ran into the shell, into the soft skin inside the shell, and suddenly head and legs snapped in, and the armored tail clamped in sideways. The red ant was crushed between body and legs. And one head of wild oats was clamped into the shell by a front leg. For a long moment the turtle lay still, and then the neck crept out and the old humorous frowning eyes looked about and the legs and tail came out. The back legs went to work, straining like elephant legs, and the shell tipped to an angle so that the front legs could not reach the level cement plain. But higher and higher the hind legs boosted it, until at last the center of balance was reached, the front tipped down, the front legs scratched at the pavement, and it was up. But the head of wild oats was held by its stem around the front legs. Now the going was easy, and all the legs worked, and the shell boosted along, waggling from side to side. A sedan driven by a forty-year old woman approached. She saw the turtle and swung to the tright, offr the highway, the wheels screamed and a cloud of dust boiled up. Two wheels lifted for a moment and then settled. The car skidded back onto the road, and went on, but more slowly. The turtle had jerked into its shell, but now it hurried on, for the highway was burning hot. And now a light truck approached, and as it came near, the driver saw the turtle and swerved to hit it. His front wheel struck the edge of the shell, flipped the turtle like a tiddly-wink, spun it like a coin, and rolled it off the highway. The truck went back to its course along the right side. Lying on its back, the turtle was tight in its shell for a long time. But at last its legs waved in the air, reaching for something to pull it over. Its front foot caught a piece of quartz and little by little the shell pulled over and flopped upright. The wild oat head fell out and three of the spearhead seeds stuck in the ground. And as the turtle crawled on the embankment, its shell dragged dirt over the seeds. The turtle entered a dust road and jerked itself along, drawing a wavy shallow trench in the dust with its shell. The old humorous eyes looked ahead, and the horny beak opened a little. His yellow toe nails slipped a fraction in the dust." In this chapter of Steinbeck�s novel, he presents the reader with a major symbol relating to his biological phalanx theory; the turtle. Steinbeck describes how the turtle uses all of its body parts as individuals together in order to succeed in what is needed for the turtle as a whole to survive. �Front clawed feet reached forward but not touch. The hind feet kicked his shell along... Pushing hind legs strained and slipped, boosting the shell along, and the horny head protruded as far as the neck could stretch... As though they worked independently the hind legs pushed the shell against the wall." In addition, the turtle�s shell also represents a phalanx. 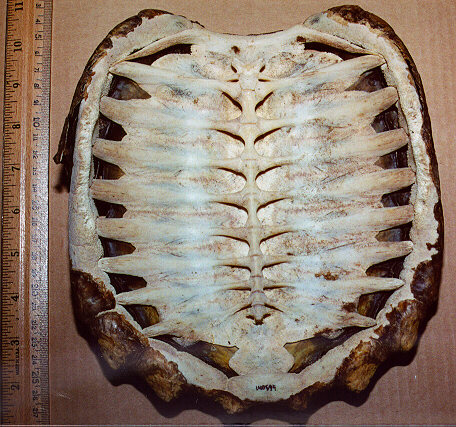 The shields in the back of a turtle all work together when placed next to each other in order to protect the creature�s inside anatomy.